Ukraine, in particular the Boryspil international airport, have good opportunities for creating an aircraft servicing site in the conditions of a shortage of these services in Europe, and the largest European low cost airline Ryanair showed its interest in these opportunities, Ukrainian Infrastructure Minister Volodymyr Omelyan has said. "In Europe, all slots are booked for two years ahead," he said at a meeting in the European Business Association (EBA) on Thursday. Omelyan said that in the middle of July representatives of Ryanair will arrive in Kyiv and they will get acquainted with the site for the possible placement of this center. In his opinion, there are enough specialists in Ukraine to provide these services, in particular, these are new opportunities for Antonov State Enterprise. At the same time, the minister said that there are barriers to the creation of this servicing center, in particular, the legislation sets high duties on the import of spare parts. 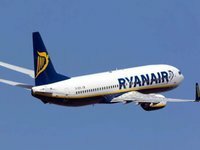 Ryanair CEO Michael O'Leary in May this year said that the airline is considering the possibility of opening of Ukraine's own data center, and in the long term it is also interested in the opening of the center for servicing aircraft in Ukraine. An examination of the regulation of these activities in Ukraine, including by the European authorities, should be conducted.